Could you tell us a bit about your yourself and your art practice? I am originally from Hamburg, Germany, but moved to the UK at age 16. I ended up staying in the UK for a total of 8 years, during which I received a degree in Fine Art and in Architecture. After my studies I relocated to Berlin, where I live and work today. My practice revolves mostly around drawing and painting. I am interested in the effect and the influence of technology on the human condition. I am particularly interested in the images generated by medical imaging technologies, and the transformative effect that these novel images have on our perception of the human body. The bodies in my work show themselves as mutations and fragments in the cross-sections and phantom views associated with medical imaging technologies, such as MRI, CT and X-Ray scans. The transparent body collages of brains, blood-vessels and bones are based on templates which I design, edit and cut with the help of a computer, and which are finally filled out on a number of mutually interpenetrating levels using foam rollers and linocut ink. You have a background in architecture, how does it influence your work? My Architecture degree has introduced me to a new world of machine orientated creation of design work, and has left me with a new skill set that allows me to use tools, methods and machines in the making of art work today. There was an encouragement to experiment and explore with new technologies and methods, in order to allow you to make your design more sophisticated. After the degree, I became interested in the idea of using the computer and other machine processes in painting. In truth, technology has been providing artists with new ways to express themselves for centuries, from early inventions like the camera obscura to tubed paint, photography and screen-printing methods. I am still using some of the software-programmes and machines, but in a way that allows me to make marks in paintings, instead of designing buildings and models. Can you tell us more about your interests in the relationship between medical imaging technologies and the human body? I first got into medical imaging out of aesthetic curiosity. I was intrigued by these unique portraits of human bodies and the scientific processes that created them. The more time I spent researching them, the more I became fascinated with the universes of images generated, that would have been unthinkable in the past; rendering visible and comprehensible things that are otherwise hidden from the naked eye. There is a fascinating symbiosis of man and technology represented in these images, showing us the world and ourselves in a new and different way, enabling us to transcend our perceptible limitations. By creating these distinct portraits, these images also enter the canon of portraits that collectively shape the very notions of ourselves. This is so interesting because these images are generated through a scientific process with clear purposes to them. It’s fascinating that these disembodied views, this scientific machine, this process with no aesthetic ambition, is to a degree shaping or influencing the notions by which we identify ourselves. Why is it important for you to portray the human figures in your works 'life sized'? It’s mostly due to the circumstances of my painting method. In my work a lot of the marks are made using stencils, and the painting is then built up through a layering process. There are imperfections, mistakes or smudges that occur in the stencils application process. I welcome these imperfections and have realised that they appear to work best on a particular scale. If the stencil as well as the foam rollers would be too large or small the effect would be less successful. There is a certain level of detail that I am looking for when making my work and it happens to work best on figures when they are more or less ‘life sized’. Over time I have built up a vast collection of stencils. I have boxes of bones, veins or skulls etc. Sticking to a particular scale allows me to reuse them in new paintings. Recycling the templates is not only practical in order to bring down the time it takes to make a piece of work, it also has conceptual merit, as it represents a truer utilisation of the machine as a tool in the painting process. This is important because I want the influence of machine on ‘man’ to be imbedded in the physical process of the paintings. In your work we see some influences from British artist, Francis Bacon, have his paintings made an impact on your practice? I understand why people could make that connection, seeing as he sometimes used medical text books as source material, and his work frequently tends towards the violent and the morbid. I have looked at his work, and even once used a triptych of his as inspiration when I was interested in Biomorphism. However, I actually find his work most interesting for how it depicts space. I personally have always found the depiction of perspective space in painting problematic. In Bacon’s work the bodies or figures are normally positioned in geometrical cage like spaces, and set against otherwise flat, nondescript backgrounds. His use of minimal lines to indicate pictorial perspective space has resonated with me, as the ‘line’ is inherently flat. In my paintings the bodies often repose in abstract, flat and context-less spaces referencing the basic, minimal, virtual and grid like backdrops provided by 3D software’s and with their simple axial nature recalling the spatial designs of early computer animations based on three-dimensional coordinate systems. I definitely lack patience with my work. The impatience is mostly directed towards the application and drying times of paint rather then the drawings and preparation prior to it. Literally watching the paint dry I find frustrating and that has led me to destroy paintings accidently before. I find however, that when working on many paintings simultaneously, it reduces the risk of that happening a little. That’s why I like to surround myself with many half finished paintings, so as to be able to work on them all at the same time. 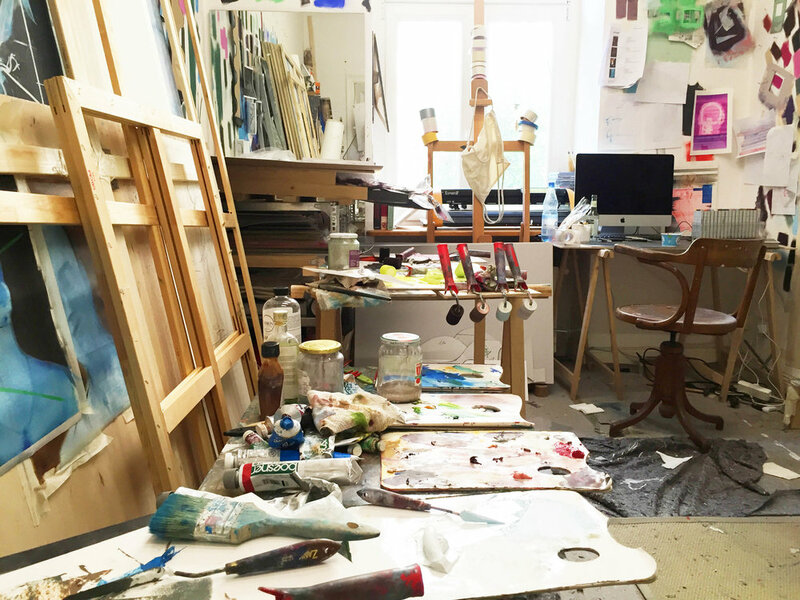 What is your studio like? Do you have any rituals or routines that helps you start your day in the studio? My studio is in my apartment. Given that I don’t have to commute, I pretty much start in the studio right after I get up in the morning. My day usually starts with lots of coffee which I tend to have in the room where I paint. However, I have found that when I get to the studio too early I just wind up sitting there, looking at my work and thinking about what I want to do to it, rather then actually starting the work. But when I do finally start I like to have music or a podcast playing in the background. I find listening to something helps me get into a zone. This year I have spent time rethinking and experimenting with my work. I have tried to introduce new elements and have thought about those elements that are perhaps less successful and can be discarded. As a result I have created a new series of smaller drawings that I am fairly happy with. However, most of my time has been spent on the development of a new series of paintings, in which I have switched up the medium they are done in. My work for a few years now has been done on large sheets of paper and occasionally on wooden boards, but the new work looks like it will be done on canvas with oils. Up until recently much of my paintings were done in lino-print colours, the kind used in woodcut printing, as they stayed wet on the foam rollers and on the pallets for longer. However, there was a limit to the subtlety of these colours, and I found these limitations increasingly frustrating. So far the oils seem to work fine so I am quite optimistic. The paintings are meant for a show, but I wont say too much at this point. If anyone in NYC is interested in working together get in touch, its been a long time since I visited.